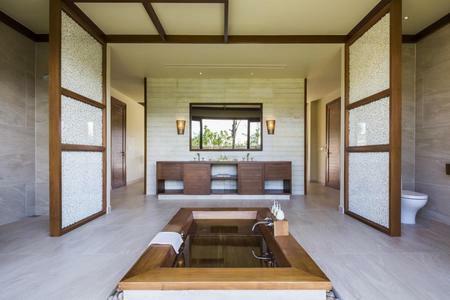 Luxury pool villas in a secluded bay on the idyllic island of Phu Quoc - where all spa treatments are included! 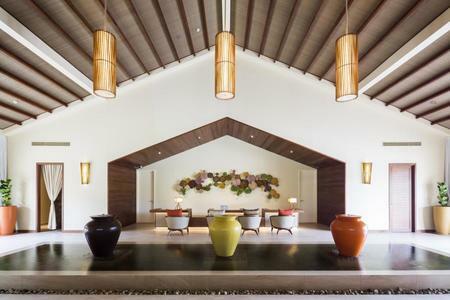 A modern all-spa inclusive resort with a rustic charm. Located in a private bay on the coastline of Phu Quoc Island, the resort boasts cosy, thatched bungalows and villas in a chic atmosphere of relaxed luxury with a breakfast any time, any place concept to take life at your own pace. 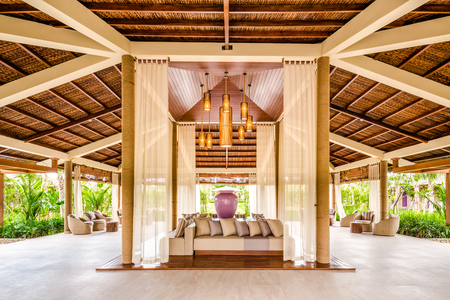 Fusion Resort Phu Quoc, located in Vung Bau, Phu Quoc Island, opened in June 2017 and is a welcome addition to the hotel scene on one of our favourite islands in Asia. The resort has 5 room categories catering to singles, couples, friends and families: 1 and 2-bedroom Pool Villas, 1 and 2-bedroom River Pool Villas, 2-bedroom Pool Villa Ocean and The Grand Beach Villa. 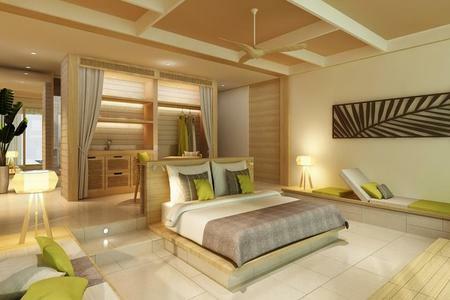 The 2-bedroom villas can be connected with the 1-bedroom villas to create 3-bedroom villas. Every room features its own private pool! 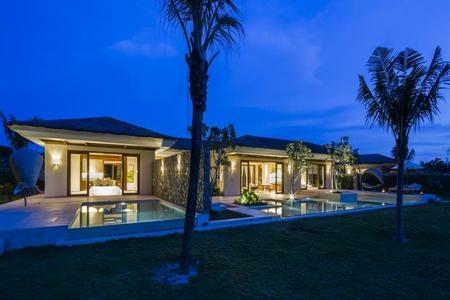 The Pool Villa is a spacious villa with a king-seized bedroom, ensuite bathroom with shower and bathtub. The outdoor area features a plunge pool and garden. The River Pool Villas are larger, with larger private pools (with either beach or river views). The Grand Beach Villa is a large 5 bedroom villa featuring 2 King bedrooms, 2 twins and one single. All rooms feature en-suite bathrooms with shower or bathtub. The villa houses a large living area, private swimming pool and beautiful beach views. 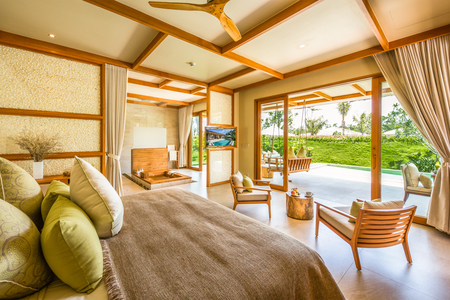 The Pool Villa Ocean is a 2 bedroom unit with 1 King bedroom and 1 twin, both with en-suite bathrooms. 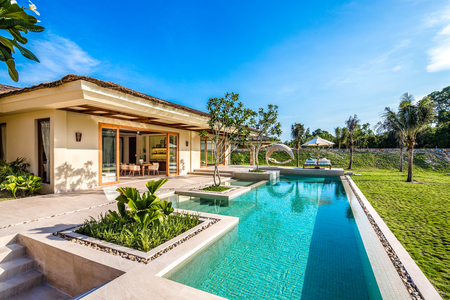 The Villas also feature a living area and large swimming pool with either beach or river views. Fusion Resort Phu Quoc offers a host of dining experiences, with carefully created menus to suit every palette. Locally sourced ingredients are used to create innovative, healthy dishes with a modern twist. Secret Garden serves breakfast, lunch and dinner; showcases an extensive breakfast menu, Dimsum and Western Fusion dishes. Pezca is a beach club restaurant offering indoor and outdoor dining specializing in local seafood with beautiful ocean views. Soul Kitchen is a beverage bar with beach views provides casual dining with finger food and tapas menus. The resort remarkably offers all inclusive Spa Treatments, well-being is part of daily life at the resort. Allowing you the freedom to relax and rejuvenate at leisure. Spa facilities include; spa garden and adult only pool, 20 double treatment rooms, steam and sauna, gym and yoga facilities.